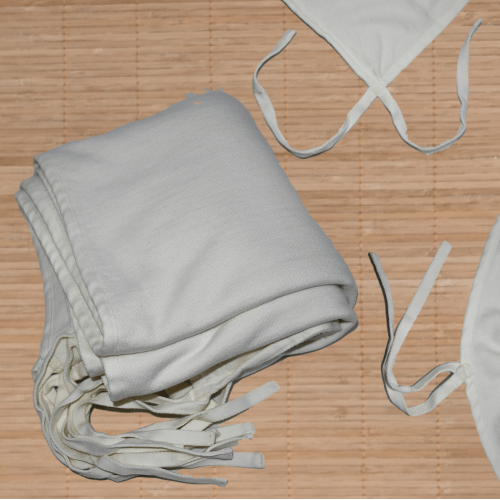 Do not hesitate to purchase large (34 inch by 76 inch) or small (sized appropriately for the Convertible Tent) rugs made of 100% organic bamboo / cotton fleece for your sauna enclosure. The fabric material is exceptionally absorbent and protects both the floor and the bamboo mat included with any sauna tent purchase from sweat and other types of moisture. Each rug is proudly made in America from a super comfy, stone-washed, and incredibly soft organic bamboo and cotton (80% and 20% ratio) fleece. This is the same material that is used for the poplar stool or alder stool covers (available for purchase in the Stools section of our website). Both rugs are perfectly sized to fit an appropriate sauna tent of your choice.